That’s what Jay Kleven told author George Rose for the 2004 book One-Hit Wonders. 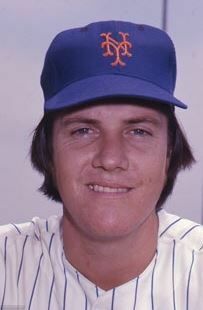 Kleven, a catcher, appeared in two games for the New York Mets in June 1976. He spent less than two weeks in The Show that month and was out of pro baseball after spring training 1978. Though strong on defense and as a team player, he was a light hitter. Nonetheless, Kleven enjoyed a couple of nice moments at the top level. On June 14, 1976, he got two hits against the New York Yankees in the Mayor’s Trophy Game, the Big Apple’s annual in-season exhibition game of decades past. It earned him his call-up to the majors. Thirteen days later, in his fourth of five big-league plate appearances, he hit a two-run single off eventual Hall of Famer Bruce Sutter. Jay Allen Kleven was born December 2, 1949, in Oakland, California. His father, Gerald “Jerry” Kleven, worked for the Pacific Telephone Company for more than four decades.2 His mother was Joy (née Hennessy), a homemaker. Jay was the second of four children in the family. He had three brothers named Geoff, Jory, and Jerry. Kleven first went to high school at St. Elizabeth’s, a Catholic institution in Oakland. He was good enough to play for the junior varsity baseball team as a freshman. As a sophomore, Kleven transferred to San Lorenzo High School, which has produced two other big-leaguers: pitcher Steve Lawson and infielder Tim Ireland. By coincidence, both of them also had just one hit in the majors. Kleven also played basketball as a guard and football as a quarterback. He didn’t have much speed, but he was a good shooter and had a strong arm.10 Thanks to his feats as a baseball player, though, he became a member of both his high school and college Hall of Fame. After graduating from San Lorenzo High, Kleven attended California State University-Hayward. Hayward is right next to San Lorenzo, and the university is now known as Cal State East Bay. With Hayward, Kleven continued to play basketball as a freshman, but he stood out in baseball. He hit .318 in 1970 and improved to .362 in 1971.11 Both years, he earned first team honors in the Far Western Conference.12 Though not a major program, Hayward’s schedule included greater powers such as Stanford, the University of California, and the University of Santa Clara. In St. Petersburg, Florida, during the spring of 1972, Kleven competed for a catching job with the likes of Larry Berra, son of Mets coach – and newly announced Hall of Famer – Yogi Berra. Nevertheless, Kleven outperformed the younger Berra.15 For his first professional season, he was assigned to Visalia in the California League (Class A), a few hours’ drive southeast of where he grew up. He split the catching duties that season with Ike Hampton, who played in 133 games in the majors from 1974 through 1979. Kleven hit .279 with 2 homers and 31 RBIs in 247 at-bats across 73 games. In 1973, Kleven married Teresa “Terry” Flores, whom he had met first in high school. They had one child, a son named Jerry. The couple remained happily married until Jay’s sudden death in 2009. As is typically the case with #1 picks, though, the organization was keen to see Bengston develop. Nolan Campbell had both catchers in spring training 1974. He told the brass, even though he knew his view would not be well received, “You can win with Kleven or lose with Bengston.”23 Indeed, Bengston never panned out as a prospect. He showed some power but was shifted to various other positions. The farthest he got was Double-A, for part of his final pro season, 1976. Kleven was invited again to major-league camp as a non-roster player in 1975. Noted baseball writer Roger Angell mentioned him briefly in his April 14 column for The New Yorker, “Sunny Side of the Street.” Kleven hit two pop flies to center during batting practice, and coach Eddie Yost said, “Try to loosen up that top hand, Jay. Just throw the bat at the ball.” Kleven then hit a liner over second base. The top Mets farm club in those years was the Tidewater Tides, based in Norfolk, Virginia. Ron Hodges played most at catcher for the Tides in 1975, but Kleven still got into 72 games, hitting .255-2-22. During his first four seasons as a pro, though, he attracted no more than passing mentions in The Sporting News. Mets starter Jon Matlack didn’t have it that afternoon, giving up five runs in the first inning. Kleven pinch-hit for Grote in the second inning and grounded into a double play against Ed Halicki. He stayed in the rest of the way; in two subsequent at-bats against Halicki, he struck out and flied out. The following Sunday, June 27, the Mets played at Wrigley Field in Chicago. Cubs starter Rick Reuschel was shelled; older brother Paul Reuschel wasn’t much better in relief. New York led 10-0 after two innings. In the top of the sixth, Bruce Sutter (the fourth Chicago pitcher of the day), retired Dave Kingman but then gave up two singles and a double. The score was 11-0 when Kleven came to the plate, again pinch-hitting for Grote. As he recalled, he fell behind 0-and-2, barely fouled off a couple of pitches, drew two balls – and then ripped one of Sutter’s split-finger fastballs between short and third.37 The single drove in Del Unser and Wayne Garrett to score the Mets’ last two runs. Kleven finished the 1976 season hitting just .174 for Tidewater (27-for-155 in 55 games). He returned to the Tides in 1977, but after even colder batting – 7-for-58 (.121) in 21 games – he was released in mid-June.41 A short time later, the Cincinnati Reds organization picked him up.42 Over the remainder of the season, he played in 13 games for the Reds’ top farm club, Indianapolis in the American Association. He was 6-for-22. Special thanks to Geoff Kleven for contributing memories of his brother. Continued thanks to Benny Ayala and John-William Greenbaum for their input. 1 George Rose, One-Hit Wonders, Lincoln, Nebraska: iUniverse, Inc., 2004: 121. 2 Gerald ‘Jerry’ Kleven obituary, East Bay Times, May 8, 2005. 4 Telephone interview, Geoff Kleven with Rory Costello, January 17, 2017 (hereafter Geoff Kleven interview #1). 5 Telephone interview, Geoff Kleven with Rory Costello, March 26, 2017 (hereafter Geoff Kleven interview #2). 6 Geoff Kleven interview #1. 7 Geoff Kleven interview #2. 8 A collection of clippings about the Post 337 team, including quite a few on the 1966 champs, is available on the Good Old Sandlot Days website (http://www.goodoldsandlotdays.com/gallery/bill-erwin-post). See also Ken Kleven’s obituary, “Kenneth James Kleven,” East Bay Times, June 1, 2002. 9 Geoff Kleven interview #2. 11 “Mets Sign Jay Kleven,” The Daily Review (Hayward, California), October 16, 1971, 13. According to this article, Kleven was a junior in 1971, but Geoff Kleven stated in interview #2 that Jay graduated from high school in 1967 and from CSU-Hayward in 1971. 13 Geoff Kleven interview #1. 15 Larry Berra hit just .127 in 22 games in the low minors in 1971 and 1972. 16 E-mail from Benny Ayala to Rory Costello, December 21, 2016. 17 Geoff Kleven interview #2. 18 Geoff Kleven interview #1. 20 Jay Kleven’s 1975 baseball card, part of a Tidewater Tides series from Stewart Sandwiches of Norfolk, Virginia. 21 Telephone interview, John-William Greenbaum with Nolan Campbell, March 2015 (hereafter Campbell interview). 22 Steve Jacob, “Herzog Talks Up a Storm,” St. Louis Post-Dispatch, April 20, 1986, 55. 24 Geoff Kleven interview #2. 25 Thomas E. Van Hyning, The Santurce Crabbers, Jefferson, North Carolina: McFarland & Company, 1999: 230. Van Hyning observed that teams in the Puerto Rican league had practice squads back in the 1970s (e-mail to Rory Costello, March 29, 2017). League historian Jorge Colón Delgado’s statistical database also shows no entry for Kleven. 27 Jack Lang, “Surprise! Mets Have New Hot Sacker, Torre!”, The Sporting News, June 5, 1976, 15. 28 “Hodges Put on Disabled List,” Associated Press, June 16, 1976. 29 Jack Lang, “Mets Stand Pat to Await Free-Agent Bidding,” The Sporting News, July 3, 1976, 12. 30 In particular, pitchers were frequently called up for Mayor’s Trophy Games in order to save the major-league staffs. The winning pitcher for the Yankees in the 1976 edition, Jim Beattie, didn’t make his big-league debut until 1978. 31 Syracuse Post-Standard, June 12, 1976, 20. The Sporting News, July 3, 1976, 34. 32 Parton Keese, “36,361 See Yankees Defeat Mets, 8-4,” New York Times, June 15, 1976, 59. 33 Parton Keese, “Mets Beat Dodgers by 2-1,” New York Times, June 16, 1976, 54. 34 Geoff Kleven interview #1. 35 Rose, One-Hit Wonders, 121. 36 Geoff Kleven interview #2. 37 Rose, One-Hit Wonders, 121. 38 Larry Stewart, “There’s a First for Everyone, He Realizes,” Los Angeles Times, September 30, 2004. 39 Rose, One-Hit Wonders, 121. 40 Paul L. Montgomery, “Mets Win, 13-3, With 8 Runs in Second,” New York Times, June 28, 1976, 44. The Times also carried a photo of Kleven fighting with fans for a foul pop in the bottom of the sixth. It must have dropped in the crowd, for none of the Chicago batters that inning fouled out. 41 “Minor Deals,” The Sporting News, July 9, 1977, 42. 42 “Mutz’ 10th Inning Single Gives Tribe 4-3 Victory,” Indianapolis Star, July 13, 1977, 37. 43 “A.A. Atoms,” The Sporting News, August 20, 1977, 40. 44 Geoff Kleven interview #2. Box score in the August 5 edition of the Des Moines Register confirms that Kleven was the catcher. 45 “Pro Transactions,” The Sporting News, December 10, 1977, 22. 46 “Tribe Rallies in 9th to Down Springfield,” Indianapolis Star, April 7, 1978, 36. Also declining the same offer was another catcher, Edward “Rocky” Jordan, who had been the Baltimore Orioles’ first-round draft pick in 1971. 47 Geoff Kleven interview #2. 49 “Washington Welcomes Three New Staff Members,” The Hatchet (Washington High School newspaper), October 12, 1990, 1. 50 Jay Kleven obituary, Inside Bay Area website, July 5, 2009. Geoff Kleven interview #2. 51 Geoff Kleven interview #2. 52 Jay Kleven obituary. Geoff Kleven interview #2.